Nighttime event and party photography takes a level of technical skill that takes many years to master, including mastery of tripod, time exposure and light painting. 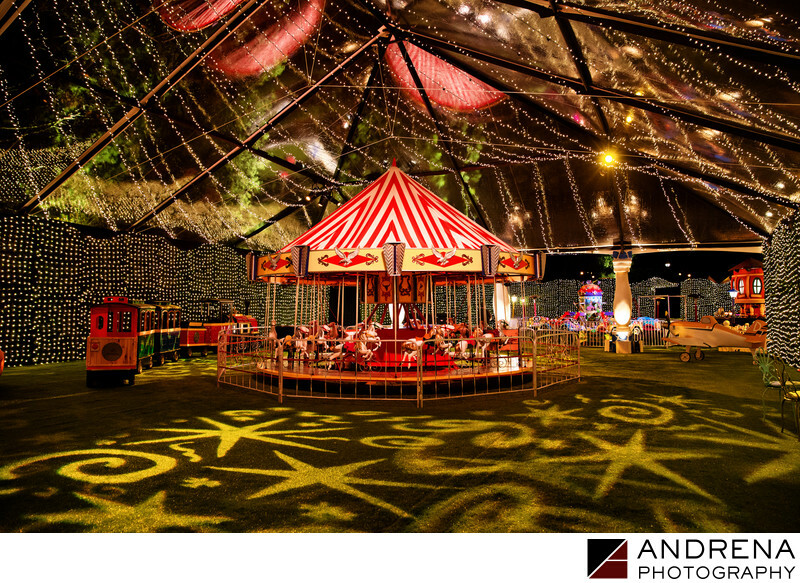 For this photo of a party carnival set up underneath a see-through tent, we took care to use a time exposure that would enable us to balance out the various lights that were being used to illuminate the carnival elements. We didn't want to over-expose the star and swirl patterns being projected onto the astroturf, so balancing the exposure took extra time and care. We also took care to ensure the maximum possible depth of field so all detail would be beautifully shown. The end result is a nighttime shot that wouldn't be possible if a photographer was attempting to shoot hand-held. Location: Beverly Park, California 91210.